Lukey15 | Feelin' Lucky? Me Neither. 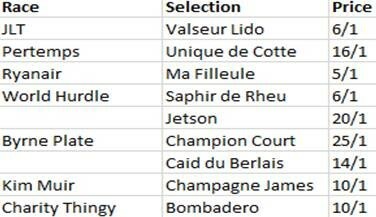 Day 4 is upon us, yada yada..
With a wildcard Lukey15 on Dicosimo, Martello Tower, Carlingford Lough and Kilultagh Vic.. Let’s be havin ya! Not much time for jibberish today, you’ll be delighted to learn..
It’s that time of year again, when all 6 subscribers fervently hit the site looking for a list of nags to mark off their potential punts for the Festival! This year, however, I come armed with a little bit of an edge, in the form of a series of incoherent jottings from the Moulson Canadian and StartSportsBets (who?!) Cheltenham Preview night in Bray last Tuesday night! Featuring an auspicious array of racing aficionados; Barry Geraghty, Jessica Harrington, Dave Keena, Donn McClean, Geoff Lester, Denis Kirwan – the crowd, bored into a sense of submission in the first hour-and-a-half by free booze and what seemed like an endless ‘warm-up’ video of old-timey Cheltenham nostalgia, produced in circa 1993, were pleasantly awoken by the jovial tone and sense of meaningful input from the panel once they finally showed up and got the show on the road. Anyway, enough of that nonsense.. selections! 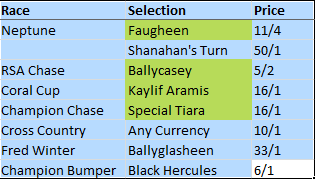 The covered the 3 biggies each day, and touched on a couple of others, so I’ll post whatever ones they tipped, along with any legible sidenotes and finish up with my picks of the day, based largely on the words on McClean and Geraghty. If you haven’t registered for a Winner account yet, they’re doing a whopper bet 10 get 20 offer and are no-runner-no-bet on the Festival already.. Sign up for an account here! The Big 8 – The only curry recipes you’ll ever need! Best piece of Irish-made Indian food stuff on the net! Been a bit quiet on the blogging front lately… I really must get more “Oirish” recipes on here, but I’ve been on a serious Indian buzz lately. Cooking Rick Stein/Mumrez Khan’s Lamb Karahi has taught me some great lessons about making curries. It’s taught me that if you have a good base recipe of onions, garlic, ginger and tomatoes, you can create many different Indian dishes. Using the “Rick Stein” base, I’ve been reading up and experimenting with many different dishes, tweaking ingredients along the way. I’ve come up with a “Big 8” list of curries – all the curry recipes you’ll ever need. I’ll post each of the following dishes over the next few weeks. These are all dishes which I’ve cooked many times over, all of the time making improvements here and there. Need one or two of these to come in if we’re to call this a worthwhile four days of solid punting. No multiples today, happy to withdraw my remaining funds this evening and let these longshots – and one banker – play out as they may..
It’s been emotional, as always. Til next year, or perhaps the Grand National, I bid you adieu. PS – I’ve just done First Installment at 9’s too as otherwise the Gold Cup will be utterly shite as I watch Lyreen Legend pull up after a few furlongs! Thank Dani Alves I even have funds to get some of these bets on! Let’s not waste your time or mine, today was pure pants, tomorrow probably will be too. Here’s my nags, Lukey15 in yellow. Wasn’t arsed renewing the ol’ Lukey15 premium domain (would rather buy four pints with the cash) so here we are, back where it all began on a free WordPress domain. Many loyal followers have used these tips in recent years as a way of narrowing the field, so to speak; by avoiding these tips at all costs, you should have a pretty fruitful festival! The less chit-chat the better, as it’s the busiest week of the year for anyone working in the industry, just thought I’d throw these out there for you all to note, and duly scratch from your plans! There’s some excellent write-ups on each of the big races in the Cheltenham Previews section of the BetBright blog, with some top-notch tips from a bone fide At The Races journo – I half nicked his tips with a pinch of my own wild optimism. By the way, if you’re looking to cash in on a free bet offer as many of us are at this time of year, you could do a lot worse than joining BetBright and availing of their £30 Risk Free bet offer – the site is currently single currency (GBP) but you can still deposit and register from Ireland – in a practical sense, that means you’re obviously betting a slightly higher amount, given the exchange rate, but in the case of this offer, if your first bet loses, you get your money back as a full cash refund, so you really can’t lose with this offer! Betbright – The Best of the New Betting Sites? We’ve seen a proliferation in recent times of loud new bookies’ looking for a piece of the higlhy-lucrative betting market action; be it the benign Betway ad I saw hitting the screen during Saturday night’s Premier League show Setanta, or the insane offer of Sprinter Sacre at evens for the Champion Chase from little-known ‘Racebets’ (lump!) – there’s a helluvalotta new contenders on the scene and it’s hard to tell which ones are good and which ones are pants. One insane piece of value we saw on Friday was a tweet about Betbright’s risk free bet for the Liverpool V Villa match. Not only did they ramp up the price to evens (unlucky for the ‘Fool fans who did lump on!) but they made it a risk-free bet, whereby you get your stake back if the bet loses. Having kept an eye on their betting updates on Twitter in recent times, it’s plain to see these guys mean business when it comes to offering genuine value to their punters. The current offer for tonight’s Premier League clash is Everton at 3/1 to beat West Brom, yes indeedy, I’ll be having some of that! All-in-all, it’s been a thoroughly positive experience with Betright thus far, I look forward to trawling through the likes of Oddschecker over the coming months and seeing what value comes in for the Cheltenham Festival and Grand National. It just goes to show, there’s still plenty of room for newcomers to make a splash by offering real value to those who seek it. There’s some excellent sign-up offers out there and I’m always keen to add to my extensive collection of registration bonuses from the newcomers on the scene! Having tried another Oddscheker-induced-newbie-discovery BetInternet last weekend, I was disappointed with the performance of their site and found locating the footy markets a little cumbersome, which is rare these days as these new kids on the block tend to be streets ahead of some of the old boys. Hopefully they sort their user journey out soon enough, on time to make a splash for the upcoming racing festivals – otherwise they’ll be left for dead by the like of Betbright and co. who seem to have hit the nail on the head with their great design and multi-screen functionality. Have you guys come across anything interesting of late, feel free to comment and share your betting gems below.. or don’t, I’ll understand.